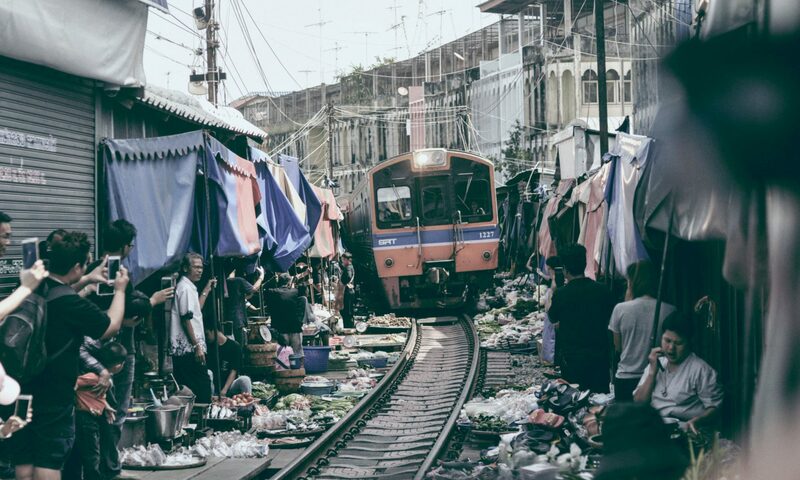 With the world getting more and more populated, and the government encouraging people to choose public transport over driving cars brings us to one conclusion – overcrowded public transport services! Currently, I live in Bolton and I work in Manchester City Centre. The most effective way of travelling is the catch the train from Bolton Rail Station to Manchester Piccadilly/Victoria. As I start work at the typical time of 9am, it’s obvious that I will be travelling to work at the peak times which means it is going to be a mission to get to work everyday. This was probably one of the worst days as the trains before the 8:08 were delayed by about a hour which means the train you see in the photo (8:12) is picking up the slack from Bolton. 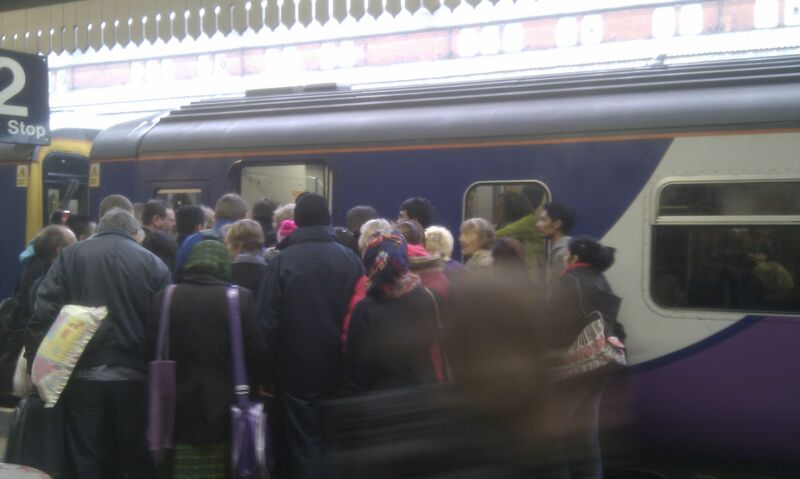 Unfortunately, for those who had to get to Manchester as a matter of urgency had to catch this already overcrowded Northern Rail train service. Following that was the delayed First Transpennine expressed train I caught (8:08) which was also full. This stayed behind the (8:12) all the way till Manchester and arrived at Manchester Piccadilly at 9:00. One can imagine the rush for people to get to work upon arrival at Piccadilly and one could say that it was pretty much stampede. I am sure someone might have got fired. Apparently, all this manic was caused by issues between Blackpool and Preston. Aside from that it is rather a known fact that generally peak time trains from Bolton to Manchester are overcrowded and action is required to rectify this as it isn’t safe any more. Many times, I have found myself having to stand in the foot well of a door or between carriages as it twists and turns or standing between loads of people having northing to hold on to. It’s not pretty. Generally, if a journey is under 20 minutes long, commuters wouldn’t mind standing during the journey as the commute is generally seen as a simple hop on and hop off. With this in mind I believe it would be a good idea to have a single dedicated carriage without seats but with hand rail bars across the top. This is because seating takes up a lot of room on the carriage and it is space that could be utilised to fit extra short distance commuting passengers. This might just be a single carriage which gets attached at Bolton (or earlier) on the rear of a train or a replacing a carriage on an existing train if it makes the train too long to fit on a platform. I understand that this is not a permanent solution but it would help the peak time commutes for the time being until a more practical solution is developed whilst taking in mind the ever increasing population. It might not be worth the money we pay for travel as we all would like a seat however the cost of travel is another article in itself. As for the delays, well, it helps in terms of getting passengers on and off the train quicker which probably saves an extra minute at each station. If the government are encouraging the use of public transport, they seriously have take action against the following: overcrowding, high prices and delays otherwise the UK will come to a stand still as no one can afford to commute to work. After all, we are the country which spends the most on public transport. You have a valid point. I was on a delayed service on Thurs 15th. I caught the 756 which came into Bolton at 0856 and terminated at my destination Stockport. this was crowded even though 4 carriages were available. You do have a point if some carriages were like the tube where seat space is minimal it would increase numbers. But this raises other issues on crime and safety too. The crowding on Bolton – Manchester commuter services has been going on for many years. The simple answer is to run a two carriage train shuttle between Bolton and Oxford Road Station. Both have turn back platforms and the same train could make three return trips between M/c and Bolton between 6.45 and 9.00. This has not occurred to Northern Rail as they have to get permission to vary their train services. If TfGM could make local decisions about rail services as in London we might get something done. That sounds like a fantastic idea. There are probably a few reasons why they would not opt for this but this I personally think it could be made to work if it is an express service. Passengers wanting to go to Manchester Piccadilly can easily jump from Platform 5 at Manchester Oxford Road (the turn black platform) to Platform 4 to catch the next train where most trains on that platform have plenty of space at this point. They don’t have to cross the foot bridge. For 9am starters, if it leaves at 8:22 (after the train to Clitheroe leaves & before the train to Manchester Victoria arrives) it will arrive at Manchester Oxford Road at around 8:38 which is enough time for commuters to get to work. Passengers won’t be entirely dependant on how trains are running before Bolton with this service. If it is an express service, it won’t be the cause of any traffic. The only issue I see which could stop an idea like this would be the Liverpool train which uses Platform 5 at Manchester Oxford Road and it may conflict. If that is the case, then the train could use Platform 1 at Manchester Oxford Road instead which is usually always empty.